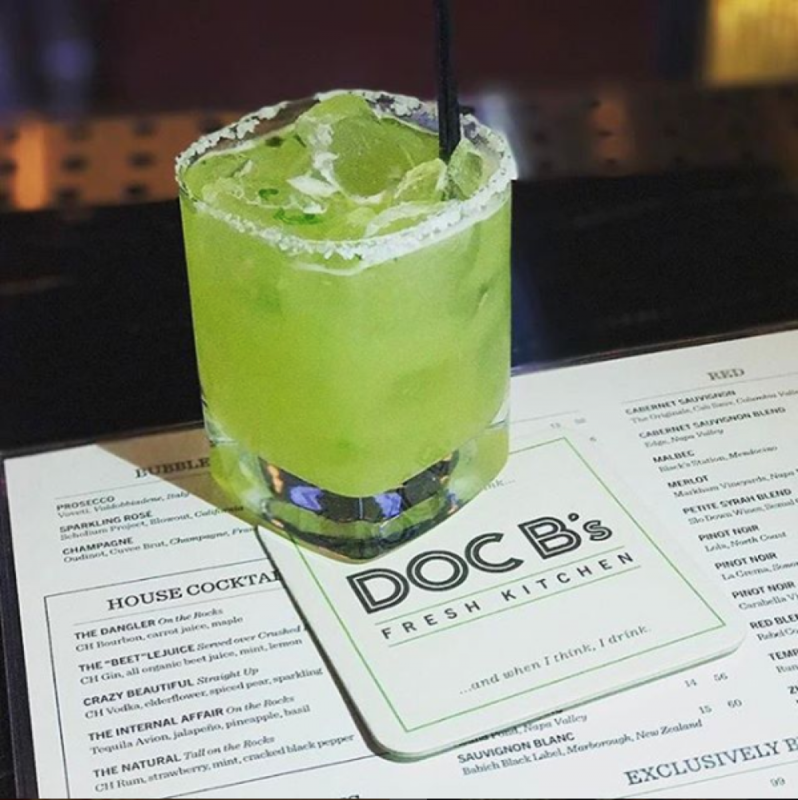 If you haven’t been to Doc B’s on Grand, you know you’ve at least walked by it a million times heading to or from the red line. They have a second location in the city on Walton in the Gold Coast, both with a bright red neon sign coaxing you in to their creatively delicious kitchen and bar. Doc B’s large menu has something for every eater including daily, rotating specials. Although some of the menu items are a little pricey, the food is truly worth its value. For starters, guests are encouraged to order the housemade guacamole ($14) served with perfectly salted tortilla chips. If dining at the River North location, the guac comes out with a tower of sweet potato chips but regular tortilla chips can also be ordered. House cocktails include the Internal Affair ($12), Doc B’s take on a margarita with Tequila Avion, jalapeno, pineapple and basil. The Natural ($12) with CH Rum, strawberry, mint and cracked black pepper is a refreshing choice especially once the weather warms up again in the spring. The bar has a number of select red and white wines along with a few typical beers for alternatives to liquor. Huge salads can be ordered for the table or as an entrée. Each is piled high with a mountain of greens and dressing. The California Salad ($15) is a healthy choice with kale, avocado, pistachio, dried cranberries, wasabi peas, roasted sweet potato topped with roasted garlic dressing. The shaved Brussels Sprout Salad ($14) is a light but tasty green garden with kale and marcona almonds tossed in Doc B’s parmigiano reggiano vinaigrette. You can’t go wrong ordering any of the burgers from the regular menu but be sure to tune in when your server goes over the daily specials. 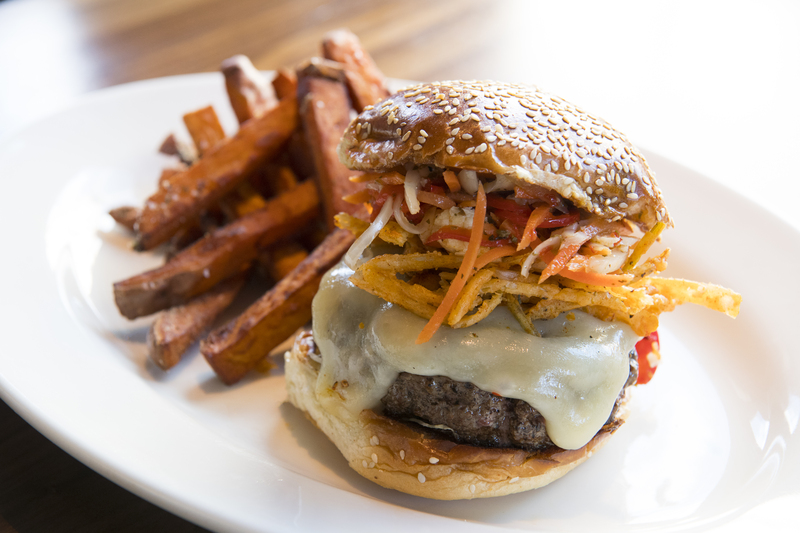 We were in luck during our visit as the kitchen was featuring a ground Tuna Burger cooked to medium, drizzled with a teriyaki glaze and topped with a sweet mango slaw between a sesame seed bun. We recommend adding a wreath of avocado slices to round out the texture and flavor of this messy burger. Each burger is served with your choice of French fries, hand-cut sweet potato fried, coleslaw or quinoa salad. The Dragon Burger is a monster with giardiniera slaw and crispy leeks topped with melted Monterey Jack and habanero-honey BBQ sauce between a sesame seed bun. There is also the Not Your Mom’s Tuna Sandwich ($20) with seared ahi, avocado, crisp apple and wakame with ginger dressing also served between a sesame seed bun. 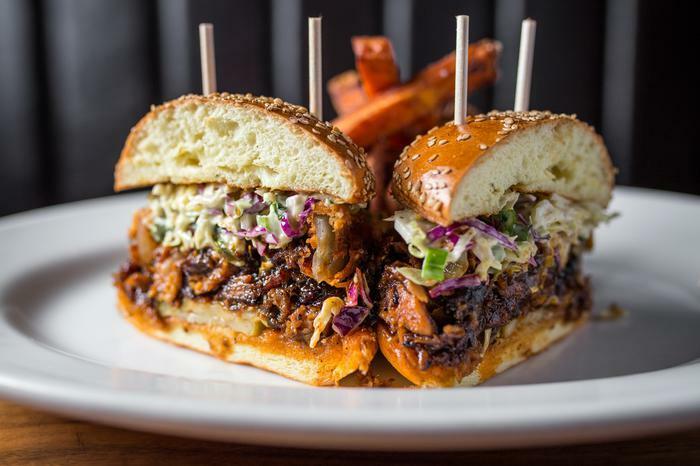 Though a crowd favorite seems to be the Carnitas Sandwich ($17) with slow-roasted pork, coleslaw, pickle and a thick onion ring topped with BBQ between a sesame seed bun. The sandwiches are also served with your choice of the sides featured in the burger section. For entrees, the boneless and fried Tennessee Hot Chicken ($25) is a delectable choice. A habanero-honey glaze blankets the chicken’s every crevice for a sweet and spicy bite every time. The dish is served with refreshing coleslaw with the option to upgrade to other sides for an upcharge. Look out for the daily Fresh Fish feature too, you never know what the kitchen will cook up! Create-your-own wok bowl is a fun feature on Doc B’s menu where guests have their choice of protein, sauce and a base. Each bowl is served with market veggies and chopped cashews. We recommend the Faroe Island Salmon ($23) with sesame teriyaki over sticky brown rice for a protein packed, health kick! 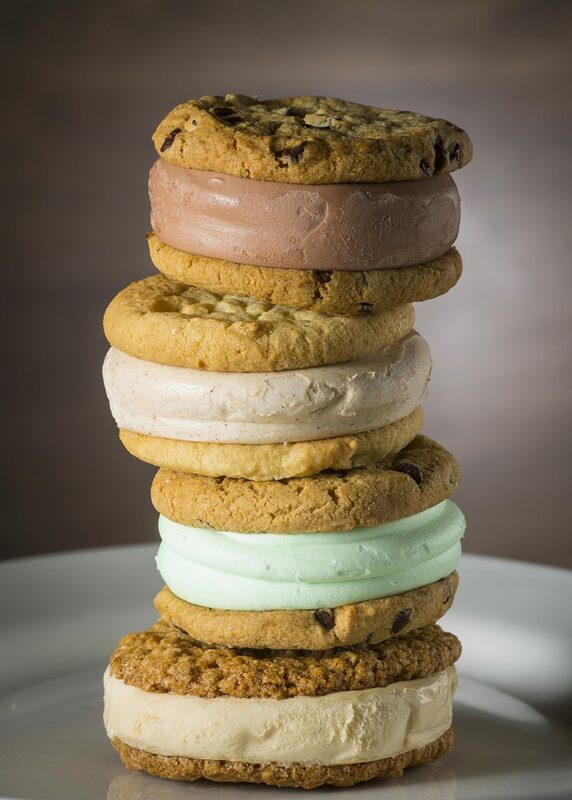 The dessert menu always rotating but the must-get item is the Gelato Cookie Sandwich. Right now, guests can satisfy their fall flavor obsession with the pumpkin sandwich. The true king of the sandwiches however is the Brown Sugar Snickerdoodle-brown sugar gelato in between two snickerdoodle cookies. No other ice cream cookie sandwich will ever compare! Both locations are open Monday-Saturday 11am-10pm and Sunday 11am-9pm. Reservations are highly recommended on the weekends!